Last week I went on a trip to Greece with friends. 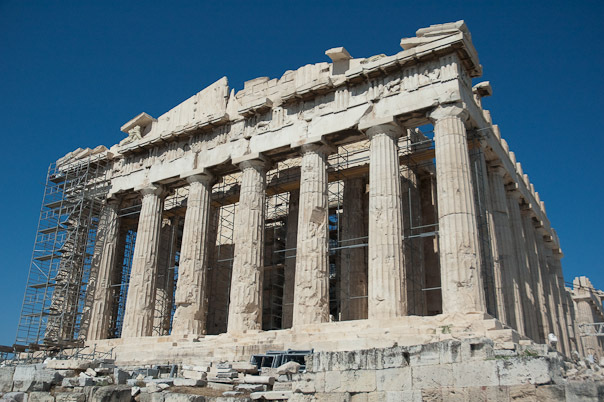 We flew to Athens, Greece on Tuesday, overnight, arriving on Wednesday. After we checked in at the hotel, we made our way to ruins which were visible from the hotel. That made for a long day, so after dinner we eventually made our way to the hotel intent on getting a good night’s sleep before we took a ferry the next day to Naxos. You may view photographs from the first day here. On Day 2, we checked out of the hotel and rode a train to the docks where we boarded the ferry to Naxos. On arriving there, we were picked up and driven to the B&B. Lunch (and working off lunch) was the next order of business. The dock area had a nice place to watch the sunset, although it was a tad breezy. The photographs for day 2 are now here. Day 3 started with breakfast at our B&B followed by a walk into town to rent scooters. Once we rented the scooters and started across the island, I kept thinking about the brown landscape before us. We did come across green patches, but I mostly remember the brown grass. After dropping off the scooters and walking back to the dock area,we found a rooftop to watch the sunset. Day 3 photographs are here. On Saturday, Day 4, we checked out of our B&B and were transported to the dock to catch the ferry to Santorini. The web page of photographs is not yet ready, but I did manage to make a group of photographs into couple of panoramas. Click on each photograph below for a new window or tab with the full size photograph. When it appears, you may have to move your mouse over the photograph and click on it to enlarge it to full size. The first one is a view from the back of the B&B. The second one is a view from the dock looking back towards the town. The web page with photographs from Day 4 is now up. You will find them here. In other news, I recreated the 3 other days. The single images are larger. Day 5 was a full day on Santorini. I was up almost early so I walked around taking photographs of the surrounding area. It turns out we were under the flight path for flights taking off from the airport. Later in the morning we were on our way to Fira, one of the larger towns. From there it was on a bus for a couple of stops. We got off and walked back to Fira. In Fira again, we took a bus to Oia, which was known for the sunsets. After walking around Oia for a while, we found a restaurant where we’d be able to watch the sunset. The evening colors made for some wonderful photographs. Have a look here for all of these photographs. We spent most of Day 6 on Santorini. Our first stop was a winery where we took a tour and then sampled their 3 wines; 2 whites and a reddish dessert wine. The dessert wine was pretty tasty and definitely sweet. We next intended to take a bus to Fira to eat at a recommended restaurant, however finding the bus was quite a different matter. Apparently no matter which side of the road the bus stop is on, it serves both sides of the road. Who knew? After we had lunch in Fira we hopped a bus to the town closest to our hotel. After the bus dropped us off, we checked out a little grocery store, just because we could. From there we walked along the black sand beach until we reached the bar / restaurant close to the hotel. One last beverage before we were taken to the airport for the flight back to Athens. Day 6 photographs are here. You are currently browsing the Brian's Blog blog archives for August, 2009.